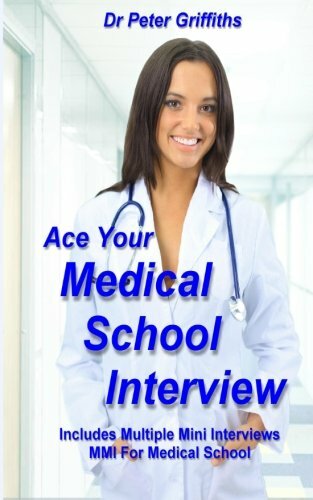 Ace Your Medical School Interview which includes a section on Multiple Mini Interviews MMI for medical school is the most student centred interview preparation book available to achieve success in your medical school interviews. This book is not overly long, it doesn't contain reams and reams of information which is impossible to memorize let alone reproduce in an interview. What it does do is set out a huge bank of actual questions asked in medical school interviews as reported by actual candidates and gives you a vital analysis of the key areas the interviewers will be looking for in your answers. The book starts with advice about things you can do well before your interview to gain an edge over other candidates. It also gives vital advice on psychological techniques you can use to build rapport with the interviewers, body language, and two verbal tricks you can use to buy time while thinking of an answer to questions. It also warns you about the dirty tricks interviewers may use to unsettle you and how to respond together with advice on the top 5 interview mistakes which could wreck your chances of a place at medical school. Next it goes into detail about the top ten most frequently asked questions followed by the next 66 most common questions as reported by actual candidates together with suggested answers which show you the common themes and patterns. Armed with this knowledge you will learn how to adapt your life experiences to answer questions on any topic and never be left struggling for words. There is also a further bank of 153 questions which students can use to practice with in their own mock interviews. Also included is an essential chapter on answering ethical case studies covering the 4 themes which nearly always appear in medical school interview scenarios which are: Confidentiality Consent Resource Allocation End of Life Decisions Finally there is a comprehensive chapter on multiple mini interviews MMI for medical school which guides you through the kinds of scenarios which may appear in an MMI and the skills the interviewers will be looking for as you complete the tasks. If you are worried about your medical school interviews then this book will allow you to take control of the situation. It will walk you through the process step by step building your confidence as you go preparing you for interview success. Dr Peter Griffiths qualified as a medical doctor from the University of London where he was a multi-award winning graduate. He has helped many hundreds of students gain entry to medical school around the world both with his medical school interview book and his popular guide to GAMSAT (Graduate Medical School Admissions Test) Griffiths Gamsat Review.